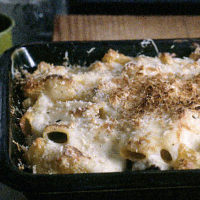 This baked dish has a unique quality thanks to the use of cinnamon and Kefalotiri cheese (Pecorino makes a good substitute for this). Heat the olive oil in a medium-sized pan and add the onion, garlic and celery; fry until it starts to brown. Add the mince and fry on a high heat for 3–4 minutes, breaking up lumps. Add the wine, tomatoes, purée, cinnamon, cloves, oregano, bay leaves, 100ml water, 1½ tsp salt and some pepper. Simmer for 30–40 minutes, stirring now and then, until the sauce is thick but still moist. Discard the cinnamon and bay leaves. Meanwhile, bring a large pan of salted water to the boil. Add the pasta and cook until al dente. Drain, transfer to a bowl and leave to cool. For the white sauce, melt the butter in a pan, add the flour and stir for 1 minute. Beat in the milk; bring to the boil, stirring. Simmer for 5–7 minutes, add the nutmeg and season. Preheat the oven to 180°C, gas mark 4. Stir 250ml (about one-fifth) white sauce into the warm pasta with the eggs and half the cheese. Keep the remaining sauce warm over a low heat; stir in more milk if it becomes too thick. Use the butter to grease an ovenproof dish that measures 23cm x 33cm x 7cm. Spread one third of the pasta over the base and cover with half the meat sauce. Add another third of the pasta, then the rest of the meat sauce, and cover with a final layer of pasta. Spoon over the remaining white sauce. Mix the remaining cheese with the breadcrumbs and sprinkle over. Bake for 40 minutes until bubbling and golden. The Corker recommends - A Malbec combines great depth with remarkable purity.